When the two-year long repaving project on the one-mile stretch of Carlson Boulevard from El Cerrito to Richmond Annex was finally completed, someone planted wildflower seeds in the dirt-filled center dividers. 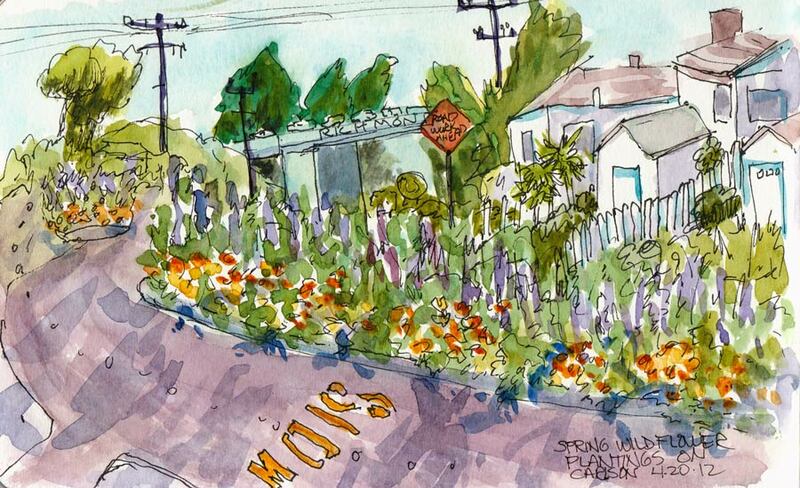 The ugly, urban street took on new life as the wildflowers bloomed into a gorgeous riot of color. There were little white ones and fluffy yellows, brilliant orange California poppies, and my favorites, the blue bachelor buttons and tall lavender lupines that stood (note past tense here) three feet high. I’m glad I spent a lovely hour enjoying sketching them because the next day work crews came through and HACKED them all down. The neighborhood email newsletter was abuzz with people horrified at the destruction. Then we found out why. There was a serious car accident and a couple of near misses because the flowers grew so high that you couldn’t see oncoming traffic on the other side of street when crossing or making turns. It was true; even in my sketch you can’t see the street on the other side of the center divider because the flowers completely hid it. Happily, new, completely different wildflowers have now sprouted, and hopefully they won’t be so dangerous and will be left to bloom in peace. Awwww…It sounds so sad at first. But I am glad that the city will go along with wildflowers that grow to a safe height, Thank you, Jana, for this great story and sketch. Great sketch, love the colours. Surely they could have just cut them at the junctions! ?